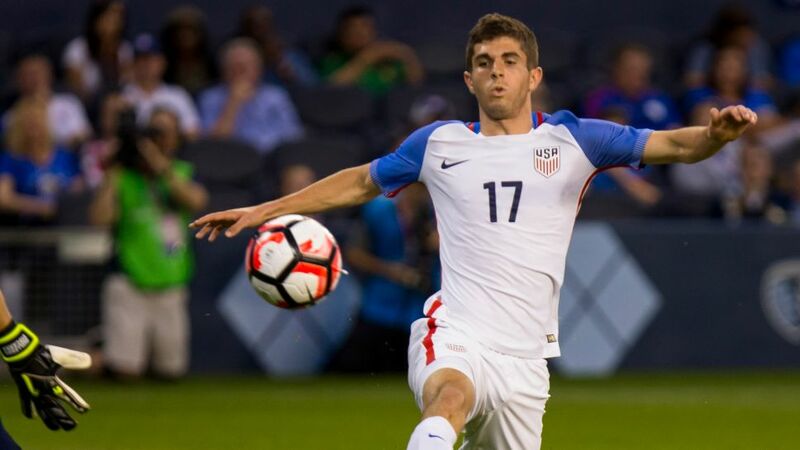 Two goals in 45 minutes saw Christian Pulisic set two more USMNT records, against Saint Vincent and the Grenadines. Borussia Dortmund's attacking midfielder Christian Pulisic is racking up the records for the USMNT as he helped them to a comfortable 6-0 win over Saint Vincent and the Grenadines in a 2018 FIFA World Cup qualifier. Click here for an overview of all international matches involving Bundesliga players. The 17-year-old, who already made history as the youngest USMNT goalscorer when he struck in a friendly against Bolivia last year, became not only the youngest player to score for his country in an official World Cup qualifier, he then added a second for good measure to be the youngest scorer of a brace. He entered the game at half-time with his team already 3-0 ahead, replacing Borussia Mönchengladbach's versatile star Fabian Johnson. His goal made it 4-0 before he set up the fifth and, in stoppage time, put the cherry on top of another show-stopping performance. Got Pulisic in your Official Fantasy Bundesliga team? Click here to pick him now! Pulisic became the youngest player in the Bundesliga to score two goals in a season last term and he is looking forward to skittling even more records for club and country in years to come. "I'm delighted that, for example, I can train with the likes of Mario Götze and Andre Schürrle - I learn a great deal from them since they've already experienced a lot in their careers," Pulisic told the German newspaper,Ruhrnachrichten. "I'm convinced we're going to have a really, really strong team and I'm looking forward to fighting for my place on it. The most important thing for me is that we're successful and if I can play as many minutes as possible at the same time, that would be perfect." And the more minutes Pulisic gets to play, the more records he can break for club and country.